This past weekend I had the wonderful opportunity to go experience Gasparilla in Tampa, which is like a big pirate party version of Mardi Gras. I've been once before in college but this time I got to experience the "pirate invasion" from the water in Tampa Bay and watch the parade from a different vantage point (a local's). 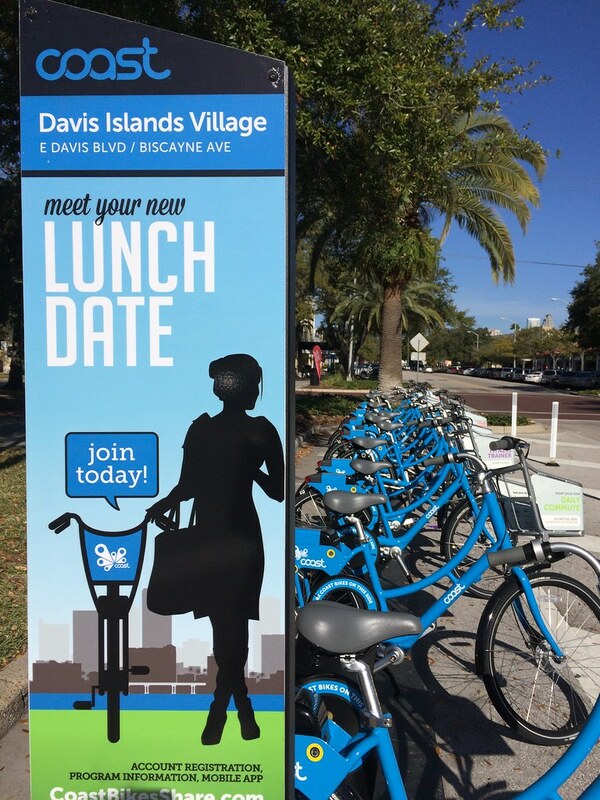 Hanging out on Davis Island, I noticed their bike share program up and running. 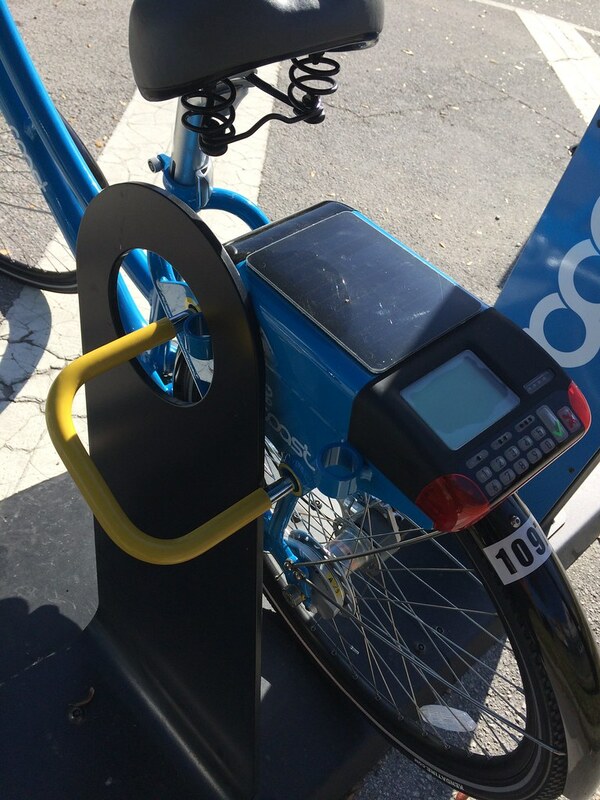 It's part of the Social Bike Share program where each bike is equipped with a lock and a GPS unit so you aren't confined to the bike share dock stations. At the same time, the West Palm Bike share program has been finally announced and bikes have been ordered! Expected to open around March. "The light is green for West Palm Beach’s bicycle rental program, even though the bikes probably will be blue. The board of West Palm Beach’s Downtown Development Authority voted unanimously last week to close what would be a 10-year deal with consultant P3GM. The consultant would cover all costs of installing the solar-powered stations and racks, with an estimated value of $1 million. P3GM would earn money from user fees, sponsorships and advertising on kiosks at stations. Projected costs would be $120 to $155 a year for an annual membership, or $15 to $20 a month with a three-month commitment. The first 1,500 subscribers would get a $99 introductory annual rate, going up later to $125. Membership would allow unlimited use. Non-subscribers and walk-ups would pay $12 to $17 a day, $25 to $35 a week, or $40 to $60 a month. The DDA had been working on the plan most of last year and the DDA and the City Commission gave initial OKs for the program in February. The agency had hoped to kick off the program this past summer. But in August, it pushed the project at least into 2015 after it heard that a high-visibility failure of a similar program in New York City had left potential sponsors nationwide hesitant. In December, the board heard P3GM finally had lined up a sponsor and the program could be running by March. “The bikes have been ordered,” authority Executive Director Raphael Clemente told the authority board meeting Tuesday. Clemente said the bikes and stations probably will have a blue theme. He also said he expects to reveal the mystery sponsor, identified only as “a financial services” firm, as early as this week. 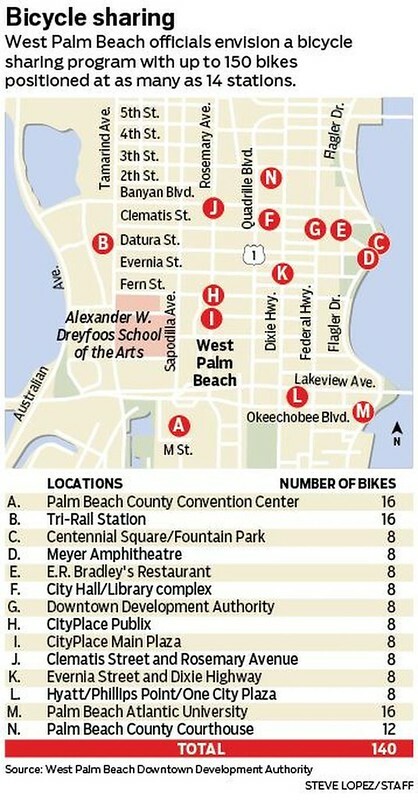 Clemente said the goal is for 140 to 150 bikes at as many as 14 stations in downtown West Palm Beach. And he said he’d welcome a partnership with Palm Beach. Clemente said the expansion will go in phases. 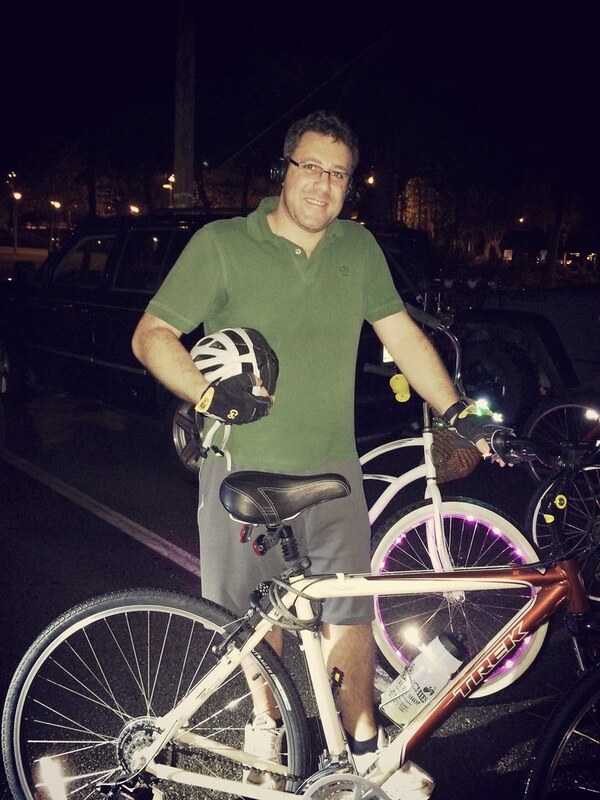 He noted that Miami Beach started with 20 bikes and now has some 1,000 at 100 stations. The bikes will be supplied by Germany-based international firm NextBike. Its web page says it accounts for 20,000 rental bikes in 14 countries but suggested this would be its first foray into the Americas. At last week’s meeting, Clemente showed a video NextBike produced of the program in use in Budapest, Hungary. "